We continue with a three part series on The Law and Love. This portion takes an overview of the Ten Commandments to glean what the Decalogue tells us of God's character and our nature. “You shall have no other Gods before me.” What does that reveal about God? He is One, he is the only God, there are no other so-called 'gods'. If God is the only God then we are NOT God. We as creatures owe everything to the Creator. We owe God our love and obedience. Our sin deserves just punishment from a just God. We owe God our worship. The first commandment tells us to worship God ALONE. The second commandment tells us how to worship God. Let me tell you about idolatry. You probably have a definition in your mind that idolatry is worshipping false gods and you are correct. The first commandment deals with that aspect of idolatry. The second command warns us against worshipping the TRUE God falsely. When Moses came down from the mountain with the tables of the law, he found the Israelites worshiping a golden calf. The golden calf did not represent a false God, it represented Yahweh. Now, do you know where in scripture that God said to make a golden calf to symbolize Him? NOWHERE!!! Now this is important because we see this commandment broken everywhere. The Israelites wanted to express worship to Yahweh; they wanted to LOOK on Him and BOW to Him and GIVE themselves to Him, but God is Spirit, God is invisible. The people wanted a visible, touchable POINT OF CONTACT. Idolatry is seeking a point of contact with God that is not prescribed in His Word. There is only one point of contact that is acceptable - the Word of God itself. The living Word of God is where we are to meet God, it is where He reveals himself, it is where we learn of our fallen nature and His atonement for our sins. We are to be a people of the BOOK. The Word of God sets us apart from the worldlings. We are to worship God in spirit and in TRUTH! God’s Word is the TRUTH! The third commandment is a warning not to use God’s name except in an honoring and respectful way. Wow! How do you swim against a tidal wave of a polluted culture slapping you in the face daily. You all know that it is wrong to use God’s name or the name of Jesus as a curse, a swear word. Try and find a popular movie today that doesn’t do that. You know, like, it’s everyones favorite, like, adjective for, like, for adding emphasis, it’s like, crazy. After “like” it’s “Oh my god.” In excitement, in joy, in surprise, in wonder, litlle kids to the elderly respond with “Oh my god.” THAT is vanity, that trivializes the name that is above all names, the name by which we are saved, the name of the Creator and sustainer of life. It doesn’t stop with words. If you call your self a Christian then you have taken the name of Christ. In other words, if you have a fish on your car, don’t drive as if God placed you above the law and gave you ownership of the road. “Look at me, I’m a jerk! Oh, and I’m a Christian too. !” “I’m a jerk for Jesus.” Don’t stain the family name. I’ll tell you what, when we repeat the Lord’s Prayer and say, “Hallowed by thy name”, “may your name be kept holy”. That means you’re praying that his name will be honored in everything YOU do and everything that YOU say. That should cause you to pause and consider your ways. Six days you should work but don’t ever complain that you haven’t time to spend with God in His Word or fellowship with the saints. You need to hear the Gospel every week. God has given us a day to break away from our work and school routine to seek Him as families and hear His Word. The sabbath is a gift. The fifth commandment is about authority. God has established order in the universe. The sun, the moon, the earth and the stars all move in an orderly manner. God has authority over all things. God has established elders over his local, visible church. They are responsible for the spiritual growth, protection and discipline of the church family according to the Word and the church’s confession. God has made husbands responsible for the spiritual growth, protection and purity of their wives. God has made dads and moms responsible for growing their children in the faith. Everyone here is a child and most of you are parents. God works through families and he established an order so give honor where honor is due. Never take the life of another person without just cause. Why? The abortion debate back in the 70s required those who wanted to kill the pre-born to invent new language and new definitions. Some decided that for life and personhood to exist there had to be a quality present they called ‘viability’. Life is not life until it can live outside the womb, that’s viability. Outside the womb it’s a baby, inside the womb it’s a ‘tissue mass’. A person is one who bears the image of God. Personhood has nothing to do with viability or quality of life, it is about the image of God. Every human, believer and rebel, carries the image of God. It’s stamped on us; we can’t escape it. It is that stamp, that image, that gives man worth and dignity - every man, woman and child. That’s regardless of skin shade, regardless of income, regardless of IQ. Everyone is an image bearer and to attack the one who bears God’s image is to attack God himself. 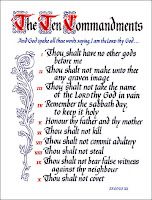 The sixth commandment is about how pro-life God is and how pro-life we are not. You haven’t murdered, good! But have you insulted someone this week? Are you holding a grudge against a brother or sister in Christ? If so, you’re not as pro-life as you think you are. I could write for pages on this one. Marriage is holy. The family is the fundamental unit within the kingdom of God on earth. Marriage is modelled after the covenant between God and His people. To break a marriage covenant is to mock God’s covenant, for what God has brought together let no man tear apart. The family is where we learn of God and his Word and his purpose. The family is God’s model for too many biblical principles to try and mention here. The level of attack that the family is under today is the proof of the immense importance and value that God has placed on the family. Fathers and mothers, you have no greater priority than the strength and well being of your family. If you don’t recognize this and get your friends to recognize it then we will lose America. Children, if you do not see the strategic importance of honoring your father and mother then we, the church, will lose our place as salt and light. The seventh commandment is “You shall not commit adultery” but it is about protecting and strengthening family. Isn’t it something, God values the private and personal property of his children. He wants us to value other peoples property as well. I won’t run down the many ways we steal - on the job, at tax time and so on. Stealing violates our role as God’s stewards and it is a sin against God because it is a sin against our neighbor. Inititially this command applied to the court room. But where would we be without the truth. We, as believers, rely on the truth to spread the gospel. We have the source of Truth, the Bible. God values the truth. We worship in truth. Jesus is the way and the truth. Our Father does not lie, his children should follow His example. We musn’t covet the possessions of others. Why? Because it questions God’s sovereignty. God tells us he will take care of us. We are so much more valuable than a sparrow that sells for two cents and God takes care of them. He has given you everything you need to live a righteous life, honoring to him. He has given your neighbor everything your neighbor needs for the same purpose. To crave what God has given your neighbor is to question his love and care for you - you question God’s plan and his promises - you cast doubt on His Word. Once again, thanks. I've been dropping by your pages as my schedule permits. And I've been benefiting from them.